Activision announced The Walking Dead first person shooter in July and we have seen a couple of screens and read a little bit about the gameplay before. A picture says a thousand words but when we are talking about a game - a video says thousands more. A new video showing gameplay, with in-game sound has been “leaked” showing us more about this highly anticipated FPS. Previous games based on The Walking Dead have been a very well received series of adventure titles based upon the comic books. The adventure game outcomes are decided by “decision-making and consequences rather than ammunition-gathering or jumping over things”. 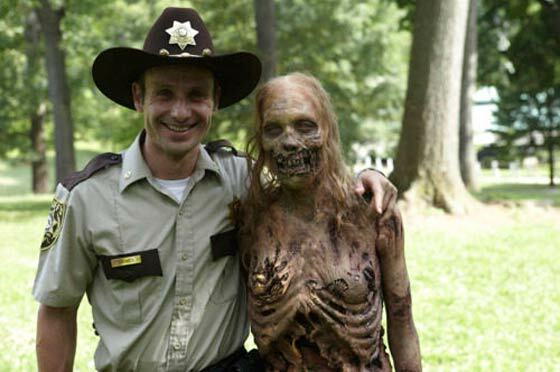 However Activision’s FPS is based upon AMC’s The Walking Dead TV series and will be much more about ammo and jumping. At this time the graphics aren’t very impressive as Gaming Blend points out; “The shaders still seem in the early stages and the shadowing doesn't seem finalized, but the actual mechanics seem to be in place, including shooting and stabbing”. There are quite a lot of zombie shooters out there now so this new FPS will have to bring something new to the table, other than its TV series tie-in, to succeed. Surviving, helping people and bring them into your team, choices and consequences will all be important in the game as will “scavenging and putting yourself at risk” according to IGN. These ideas do sound interesting, engaging and in line with the TV show ideas. Hopefully we will see a lot more info and gameplay footage before The Walking Dead: Survival Instinct hits Xbox 360, PlayStation 3 and PC in 2013.